« Great Days On The Water! Just Hard To Beat The Fishing Right Now! Nice, sunny, low 80s day today. Very slight chances for a stray shower today and again tomorrow. Expect mostly sunny day again tomorrow. Our best chances for rain pop up again on Saturday with scattered morning thunderstorms, then cloudy during the afternoon. Slight chances again Sunday morning. Temperatures are ranging in the mid to upper 80s throughout this period. I think I mentioned that they shut back five of the flood gates on Tuesday. Right now, between the flood gates and the generators, we are seeing less than 9,000 cfs plus on water flow. This is even less then they run with 4 generators going. The tailwater level is just a little over 708 feet. Rumor is that if we don’t get a lot of rain this weekend, they might cut back more or end spillway releases early next week. Gina out with Jim yesterday and they had a great day. During the morning, they nymphed with the lightning bug under the big ruby. After that, they finished up the day stripping the floozie or crackleback. Bob, from Arizona spent all day on the water with Stan. Great day for him too, with the lightning bug under the big ruby; then it was stripping the tiger tail or crackleback. Another beautiful, fun day for everyone. 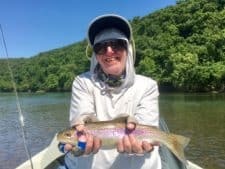 This entry was posted on Thursday, June 1st, 2017 at 2:48 pm	and is filed under Fishing Reports. You can follow any responses to this entry through the RSS 2.0 feed. You can leave a response, or trackback from your own site.